In her March 22 article in the New York Times, Liesl Schillinger wrote that she wanted to capture the Miami restaurants and tourist haunts that are "uncool" and serve "the salty fried food, the lime-drenched cocktails." However, New York Times readers might have an appetite for suggestions beyond Joe's, News Cafe and Puerto Sagua, especially since these locations have been mentioned in many articles about Miami travel in the Times and other media outlets. See the map of restaurants. - For a shot of Miami right upon arrival, drive southwest from Miami International Airport for 15 minutes or so to La Palma. Order at the open air counter and then grab a seat, or just enjoy your snack standing up, as many locals do. Depending on the time of day, La Palma can either be lively with the animated conversations of regular customers or relatively quiet, minus the whirring and clicking of servers making Cuban coffee. 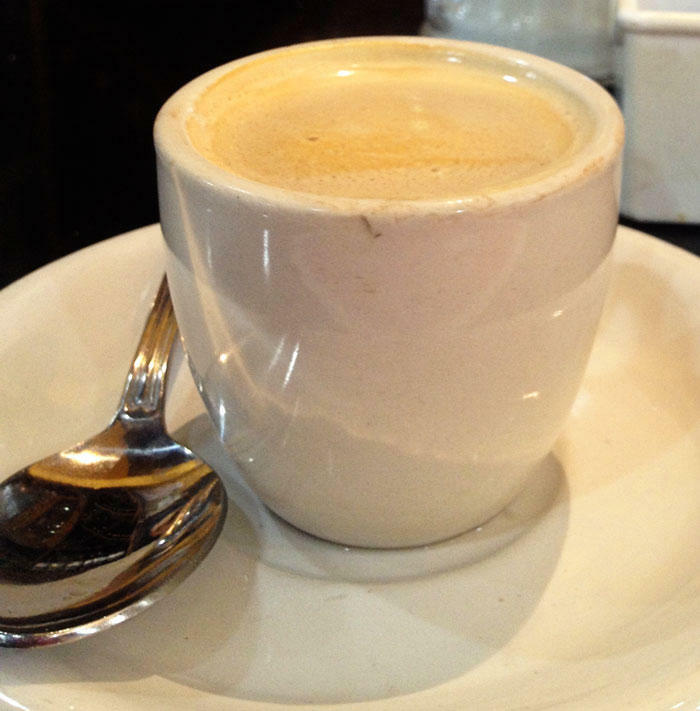 - For Cuban coffee in all of its forms, along with ham or chicken croquetas. - During his presidential campaign, Mitt Romney decided to pass up Versailles for this spot the Coral Way branch of this business and we have to agree with his choice. Versailles is historic, but at this open-air food and juice stand 10-15 minutes from Miami International Airport, you can get Cuban coffee, heaping portions of fried yuca with sour, garlicky mojo sauce and juicy shredded beef on rice called ropa vieja. - For fruit juices like guanabana (or soursop) and for coconut water, from a coconut hacked to order by a machete-wielding employee. - For real deal chicharrones, each with a crunchy charred side and a fatty side. It's best to share these; the pork rinds reveal their grease content soon after they are shoveled into a paper bag. - For distinctive ice cream flavors like caramel flan, sweet plantain or Abuela Maria, made with cream cheese, guava and the Maria cookies many Hispanics grew up eating. - For a spot that balances the traditional feel of Calle Ocho with a more modern, youthful spirit. - If you're not too hungry and you're in the area, at least pass by for a coffee and Cuban toast. Try the tostada even if you're not a toast fan. Pressed Cuban toast with butter can be transcendent. - For a delicious and cheap breakfast tortilla, which is an egg dish similar to a frittata. Plantains and cheese in a tortilla is true Miami. The inside of Garcia's restaurant is reliably nautical. 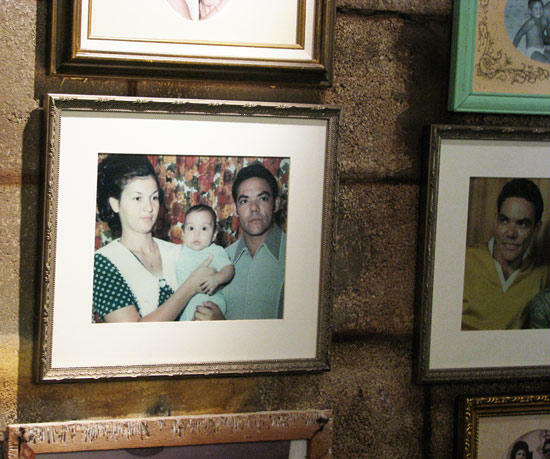 Garcia family photos hang inside of the restaurant. - For the instant feeling of relaxation when you sit down at one of the picnic tables overlooking the Miami River. Come here for a no-frills lunch and you'll see why so many regulars flock to this family-owned restaurant on their break. Make sure also to take a peek at the languid bar inside. -For the complimentary fish dip you get when you arrive, for fried or fresh grouper sandwiches and for fresh stone crab when it's in season. - Most of the fish served here is still caught by fishermen contracted by the Garcia family. The fishermen deliver to the fish house down the street. - For comforting, affordable and tasty diner food like vaca frita on tostones (pulled fried beef on fried green plantain patties) and the "Corben" beef brisket sandwiches, named after local film director and producer Billy Corben (Cocaine Cowboys, The U.) Unlike most diners, there is a large, rotating selection of vegetable dishes here. - For affable staff, including chef-owner and Miami native Daniel Serfer, who you can usually find in the open kitchen. It's in a tiny low-key space in one of the old hotels of the MiMo district. - There are no reservations accepted and it is a very tiny space, but you can always get your meal to go. -For samba dancing: Join the free Monday night lessons, starting at 9:30 p.m., or just watch the dancing while you nurse a caipirinha made of cachaça liqueur, sugar and lime, or a caipiroska made with vodka. -For frango a passarinho, the Brazilian take on fried chicken, bolinhos de bacalhau or codfish croquettes and pasteis, fried turnovers filled with cheese, meat or shrimp. 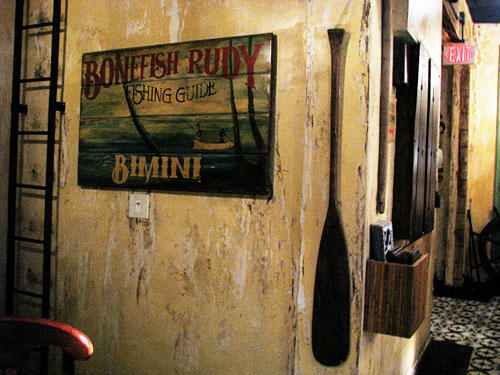 -For a casual, easygoing vibe: This is a place to relax, so no fancy attire necessary. - For creole shrimp and griot (fried fatty pork chunks) with biting pikliz (spicy pickles) under the tiki hut. - For jars of pikliz to take home as souvenirs. Update: This restaurant's future is uncertain as well, at least temporarily. On Jun. 13, 2013, Schuckers' outdoor deck collapsed. - Given the uncertain future of Scotty's Landing, Shuckers provides another laid back option for drinking beer, eating fried seafood and gazing at the water. - For hot peel-and-eat shrimp with Old Bay seasoning: simple and just right. A picnic spot on the beach near South Pointe, just a short walk from My Ceviche, provides a view of passing cruise ships. This photo was taken in the evening, although the most reliable time to see ships is late afternoon. - For a waterfront picnic: The Miami Beach location (there's another in Brickell) is take-out only, so walk to the beach nearby or to South Pointe Park for a picnic, or sit at one of the tables along the waterfront path behind Monty's, a Miami institution. 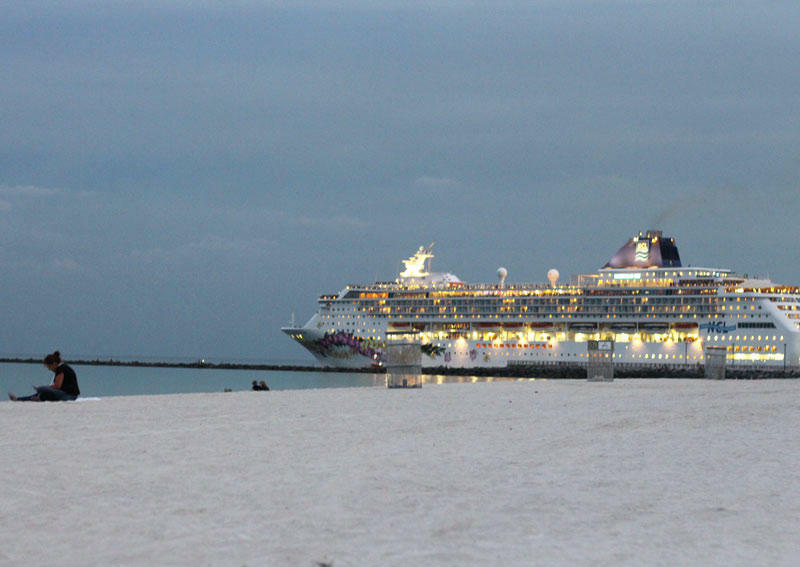 If you're lucky you'll see one of the behemoth cruise ships floating out from the port; between 4 and 5 p.m. is a likely time to sight one. - For delivery to your South Beach hotel when you just can't see any good reason to leave the amazing view on your balcony. A tip: don't wait until you're famished, as sometimes delivery can take a while. - This Jose Andres restaurant is an import, but it's a fun place to take out-of-town guests for equal parts tropical outdoor dining, fine food and spectacle. - One recommended plan of action if you don't have the budget for a full meal here or if you have other dinner plans: Start the evening early at the outdoor Bar Centro. Order liquid nitrogen caipirinhas, which a server whips to order. Spoon/drink your snack as the sun sets. 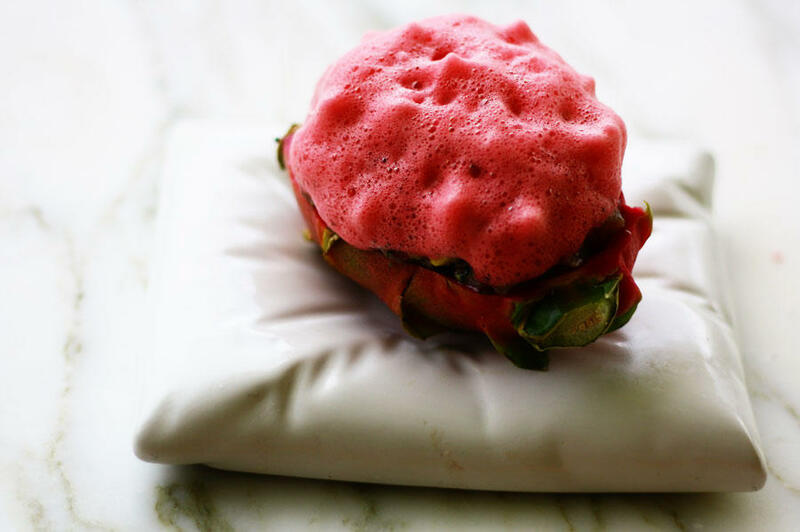 Dragon fruit ceviche at The Bazaar by Jose Andres: The tuna ceviche is inside the hollowed out fruit and topped with dragon fruit foam. - The outdoor bar and restaurant at this hotel is an especially lovely spot to take out-of-town guests to show how fabulous our tropical home can be (especially if they are escaping winter). - Although the food here is pretty good, this is more of a place to enjoy one or two overpriced, but tasty, cocktails while soaking in the sunset, the water, the downtown and Miami Beach city views and the relaxed, adult summer-camp vibe. Afterwards, walk over to Sunset Harbor for dinner. See more locals' suggestions for where to eat and drink in New York's "The Urbanist: Miami" article from Mar. 22. "Venture to Coral Gables, Coconut Grove, Brickell, Key Biscayne, and God-forbid, Hialeah or Miami Lakes. Visit El Palacio de los Jugos on Flagler St. for the original fruit smoothie, invented long before the word 'smoothie' came along and with a greater array of fruits than even the best-stocked Whole Foods. While you're at it make sure you take in 8th St. on a Friday night and stop in at Casa Juancho where you can see virile 70 year old men charming women in their 60's in old-world gentlemanly style. It's a spectacle worth seeing at least once before you die." -L.M. from Frederick, MD. If you don't know who Gaston Acurio is, chances are you will soon. 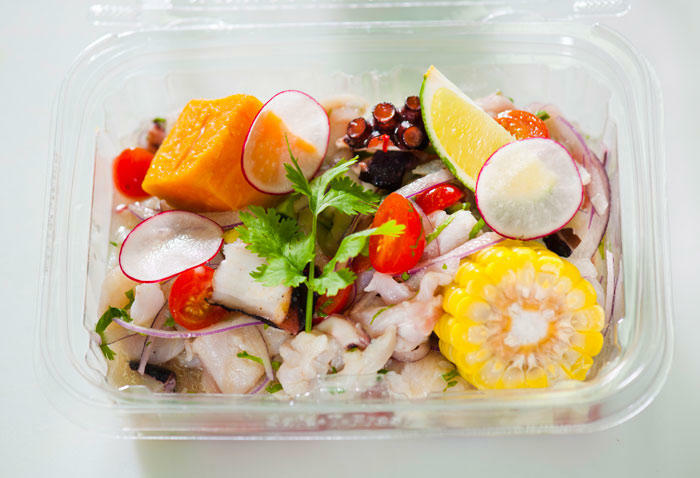 The Peruvian chef, who is arguably the face of Peruvian cuisine both in his home country and around the world, visits Miami this weekend for the South Beach Wine & Food Festival. Last month, Josh's Deli in Surfside was transformed into the Saffron Supper Club. The lights were turned down, and the duck prosciutto and smoked salmon were tucked away. Candles covered the long diner counter, and an infatuating aroma of nutty rice tahdig greeted dinners.